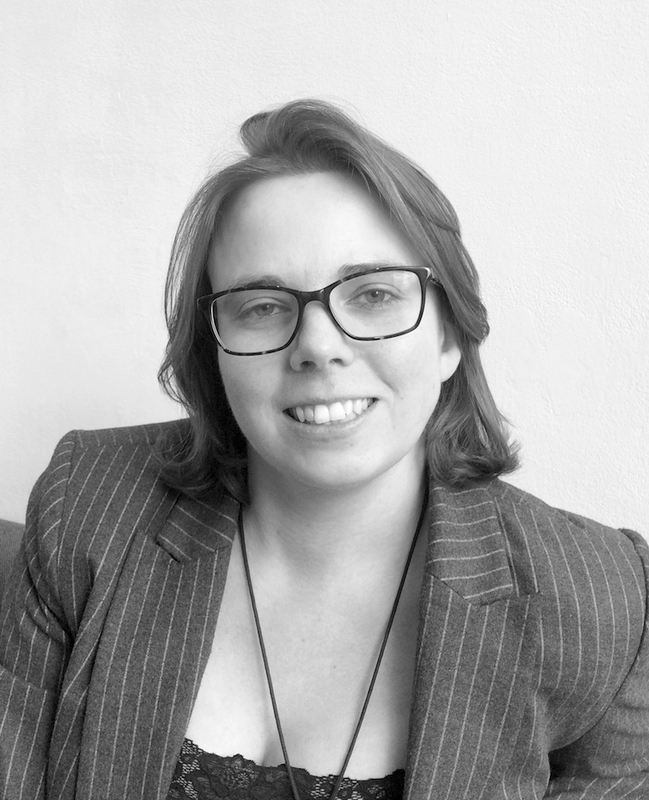 Cranfield University Blogs | Designing immortal products at C4D! Designing immortal products at C4D! When I first heard the term ‘self-healing products and materials’, I thought it sounded like science fiction! However, I was soon to discover that there were many scientists and researchers around the globe working to make this technology a reality, opening up a whole new stream of smart material and design research possibilities. As a designer and sustainability enthusiast by background, the idea that we could create products and materials that could autonomously repair themselves, frankly, sounded really cool and something I had to get involved with. 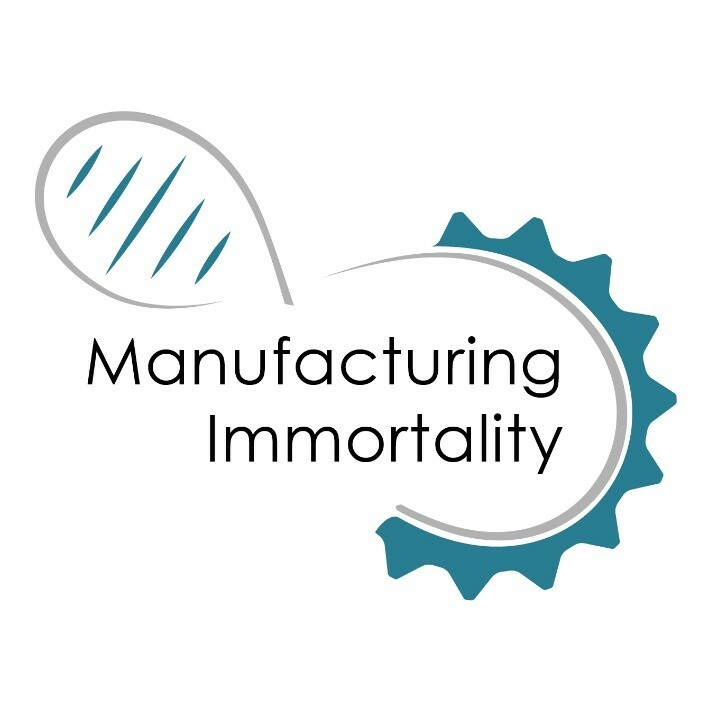 Luckily I was chosen to join the ‘Manufacturing Immortality’ team, which is an EPSC funded research consortium between Cranfield University, University of Bristol, University of Aberdeen, Lancaster University, University of Manchester, Northumbria University Newcastle and Sheffield Hallam University; and I was given the chance to investigate the design opportunities and sustainability implications of integrating this new smart material into products. 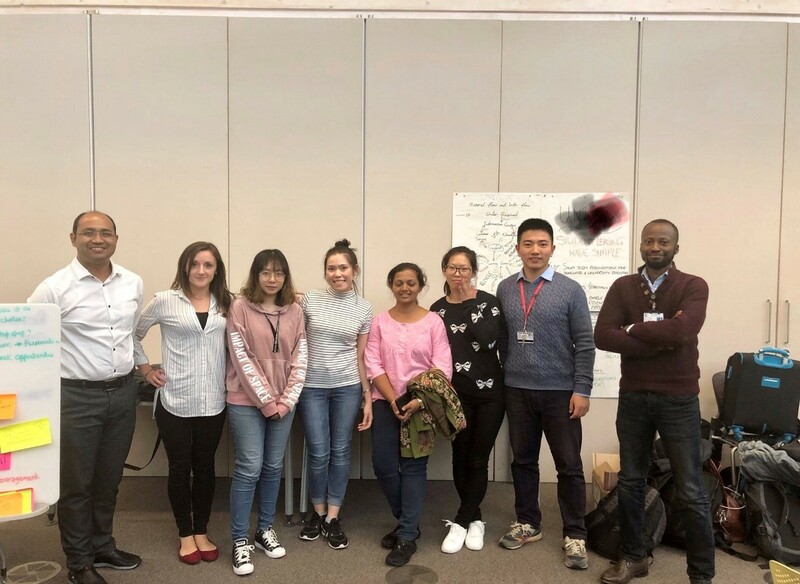 As a former master’s graduate in Centre for Competitive Creative Design (C4D) myself, I was happy to return to Cranfield and to the department that helped me to begin my career in academia, but also excited to be examining such an interesting topic alongside industry and researchers from 6 UK universities as well. 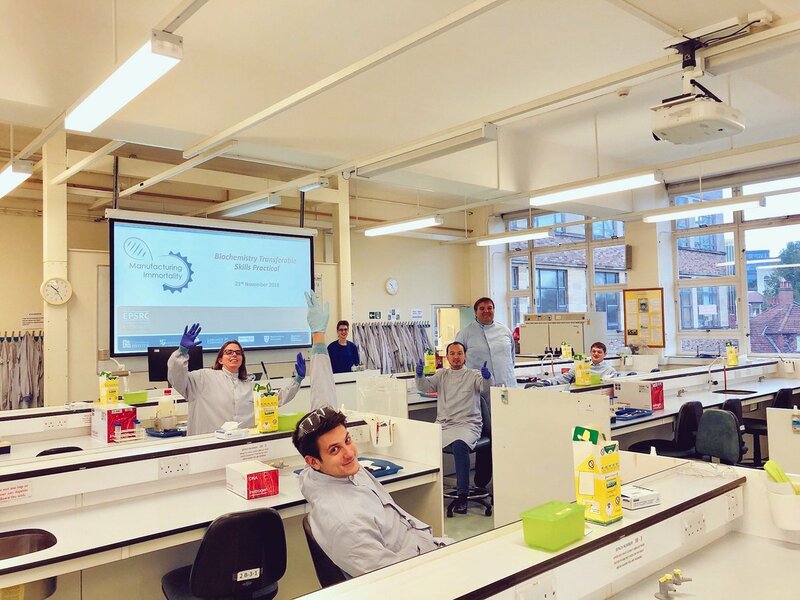 A multi-disciplinary team, we are mix of chemists, biologists, engineers, scientists and designers each tackling a different aspect of how to develop self-healing materials. To give you a little more back ground on how self-healing materials work, essentially there are two main categories of self-healing materials intrinsic and extrinsic; extrinsic self-healing materials introduce a healing agent to the damaged site either through microcapsules or vascular networks, much like how your own skin heals. Whereas intrinsic self-healing materials have an innate self-repairing capability which occurs at a molecular level, and is activated by stimuli, such as heat or mechanical force, and so these materials can just be left out in sun, or pushed back together and they will heal like new. These materials can be used in loads of different applications, and it’s my job to figure out the most environmentally and economically beneficial uses. 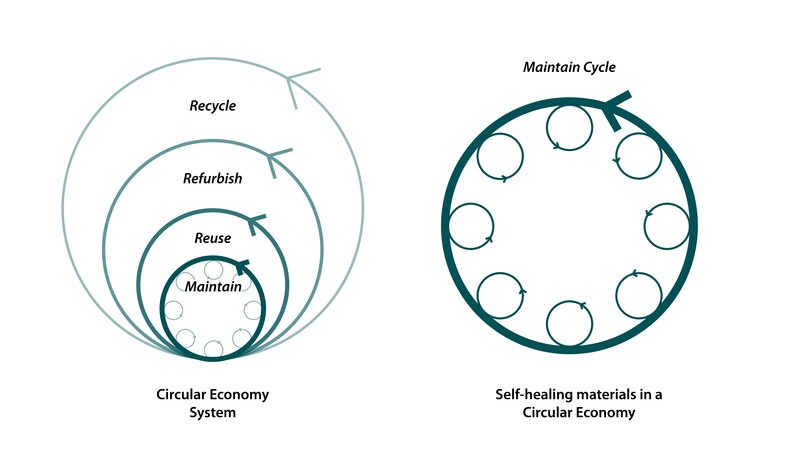 Within sustainability systems like the Circular Economy, if a product is able to heal itself this would extend its useful service life, reducing the environmental impact and costs associated with undertaking such a repair as shown in the figure below. One scenario that really benefit are batteries, for say laptops or electric cars. As most people have experienced, batteries degrade over time and so don’t hold their charge as well after a few years, but if we apply self-healing technology they can stop this degradation from occurring, which results in longer lasting, better quality products for consumers. This is just one example, but throughout the next 2 years of this project we are working closely with industry partners such as Siemens, Ellen MacArthur Foundation, Zentraxa and Overlander Batteries, to find the most exciting opportunities, and hopefully will contribute to reducing the environmental burden that industrialised products and materials place on the world.